A supporter of the Gandhian philosophy of nonviolent protest, the Reverend James M. Lawson, Jr. was one of the Civil Rights Movement’s leading theoreticians and tacticians in the African American struggle for freedom and equality in the 1950s and 1960s. Raised in a household of 10 children, Lawson was born in Uniontown, Pennsylvania on September 22, 1928 to the Reverend James Morris and Philane May Cover Lawson, Sr. Although born in Uniontown, Lawson grew up in Massillon, Ohio, which is where he received his primary and secondary educations. After high school, Lawson entered Baldwin-Wallace College in Brea, Ohio in 1947. During his years at Baldwin-Wallace, he became a member of the Fellowship of Reconciliation (FOR) local chapter and the Congress of Racial Equality (CORE), both of which were devoted advocates of direct nonviolent resistance to racism. Consistent with his beliefs towards nonviolence, Lawson became a “conscientious objector” during the Korean War. In April 1951, Lawson was found guilty of violating the draft laws of the United States, and sentenced to three years in a federal prison. Upon his release from prison, Lawson returned to Baldwin-Wallace and earned his bachelor’s degree. Afterward, Lawson traveled to India to work the Methodist Board of Missionaries. While in India, he studied the Gandhian principles of Satayagrapha, or the strategy of nonviolence. Lawson would later use these principles to combat and end racial segregation in the US. Upon returning to the US in 1956, Lawson entered Oberlin College’s Graduate School of Theology. In 1957, one of Lawson’s professors introduced him to the Reverend Dr. Martin Luther King, Jr., who urged him to move south and aid in the Civil Rights Movement. Heeding King’s advice, Lawson moved to Nashville, Tennessee and enrolled at the Divinity School of Vanderbilt University, where he served as the southern director for FOR and began hosting nonviolence training workshops for the Southern Christian Leadership Conference. There Lawson trained many of the future leaders of the Civil Rights Movement, including James Bevel, Diane Nash, John Lewis, Bernard Lafayette, and Marion Barry. 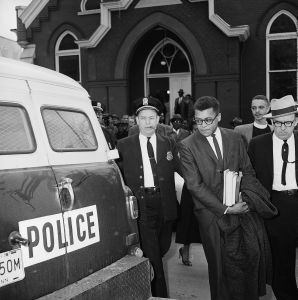 In 1960, Lawson was expelled from Vanderbilt for organizing the Nashville student sit-ins. Lawson moved to Memphis in June 1962, where he became pastor of Centenary Methodist Church, one of the largest churches in the city. He also continued his organizing activity. Throughout the decade, he led various community movements for racial justice in Memphis. In 1968, while involved in the Sanitation Workers strike, he invited Dr. Martin Luther King Jr. to Memphis to speak where 15,000 people heard his famous “I’ve Been to the Mountaintop Speech.” King was assassinated in Memphis the following day on April 4, 1968. In 1974, James Lawson moved to Los Angeles, California where he became pastor of Holman United Methodist Church and continued his social activism now on Palestinian and immigrant rights; gay and lesbian issues; the Iraq wars; and poverty. Rev. Lawson retired from Holman United Methodist Church in 1999 and still lives in Los Angeles. Henry Hampton, Steve Fayer, and Sarah Flynn, Voices of Freedom (New York: Bantam Books, 1990); Sanford Wexler, The Civil Rights Movement: An Eyewitness History (New York: Facts on File, 1993); "James Lawson Named 2005 Distinguished University Alumnus," Tennessee Tribune, December 22, 2005.